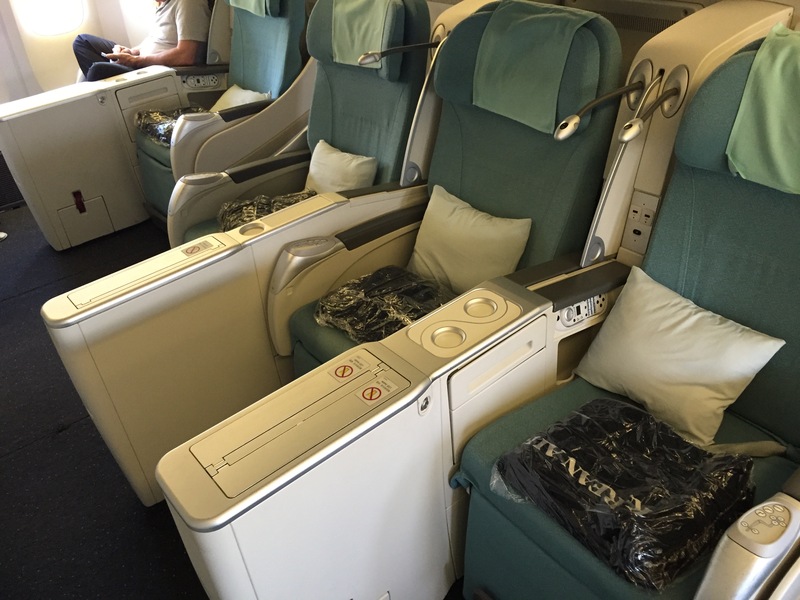 Korean Air Business Class from Seoul (ICN) to Seattle (SEA) | No Mas Coach! The boarding was extremely efficient and was separated out at the gate into first/business/economy lines, and there was someone working the lines to make sure that no one was in the wrong line. 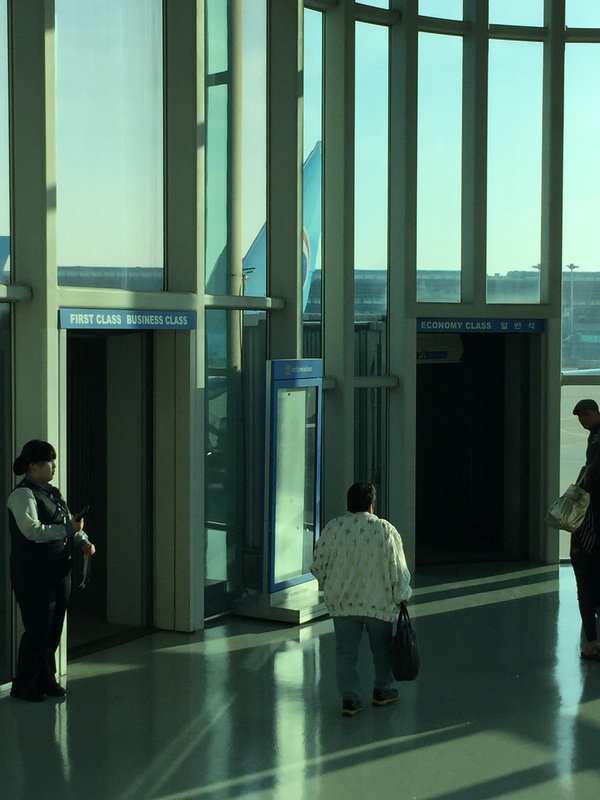 Once we cleared the boarding pass and passport check, we headed down the stairs to find double boarding doors. One for premium classes and one for economy. Once we boarded we were greeted with a light bow and asked for our boarding passes in order to direct us to our seats. Korean uses a 2-3-2 configuration in business class, which can be really unfortunate if you’re the guy stuck in the middle. Not only do you have two strangers on either side, but you’ve got to dance and stretch to get to the bathroom. Not the best location; I’d suggest going for one of the seats on either side. Luckily this flight wasn’t too full, and Ben and I had seats 2A/B. 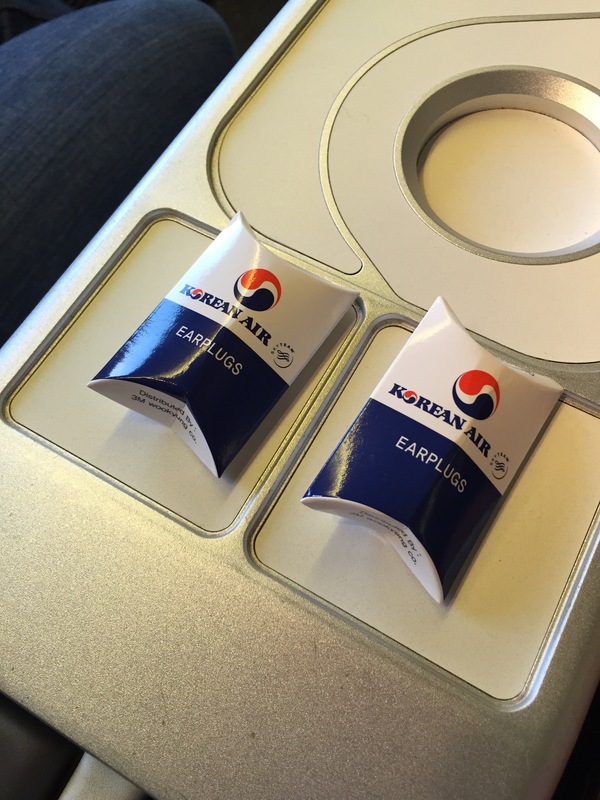 At the seat was the Korean Air blanket and mediocre pillow and these luxurious headphones. Seriously? These are the kind of headphones that came with a Sony CD player back in the 90’s. 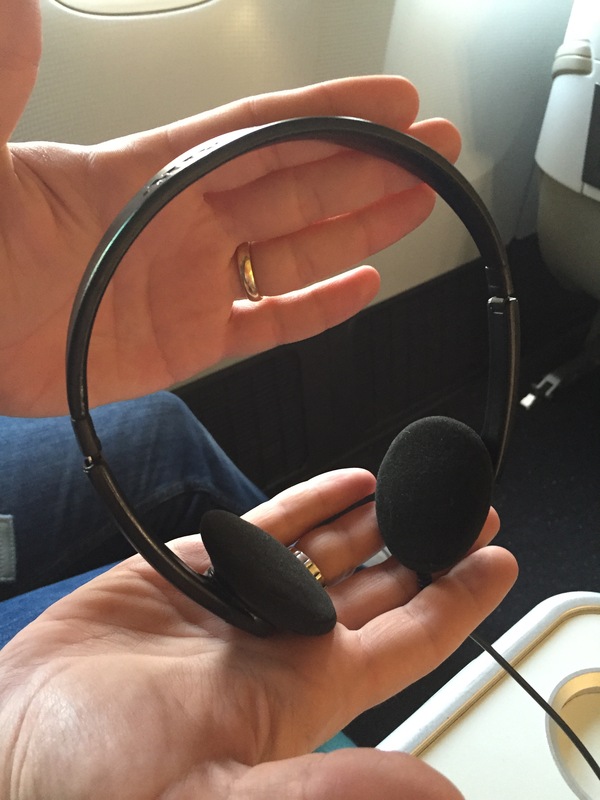 These are in serious need of an upgrade, considering that most other airlines offer at least a noise cancellation option to their business class passengers. When I asked about noise cancelling headphones they said that they were not offered, but they could offer me a better solution. See below for the Macgyver-ed solution. 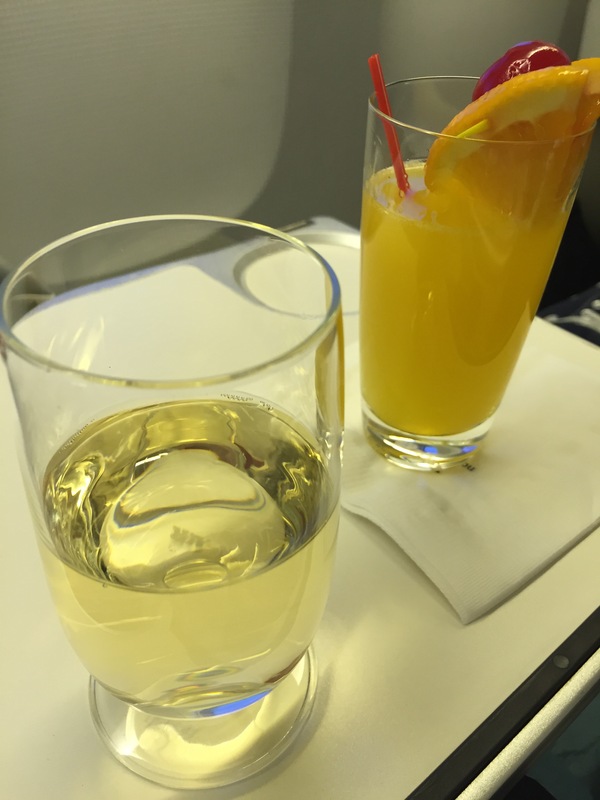 Preflight drinks were passed out, and we opted for both the fruit juice and the Champagne. 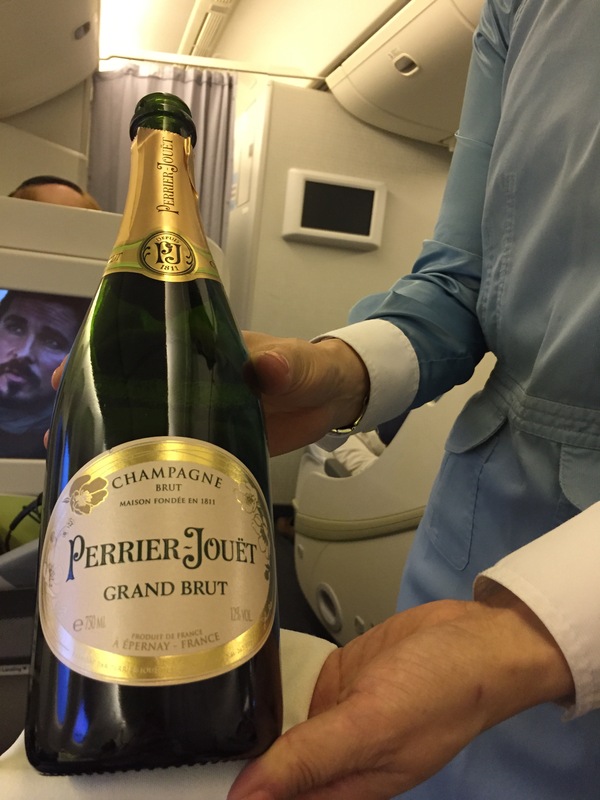 After take off, I continued the champagne run, because since the bottle was opened we mine as well finish it, right? Perrier-Jouet Grand Brut was a great option. 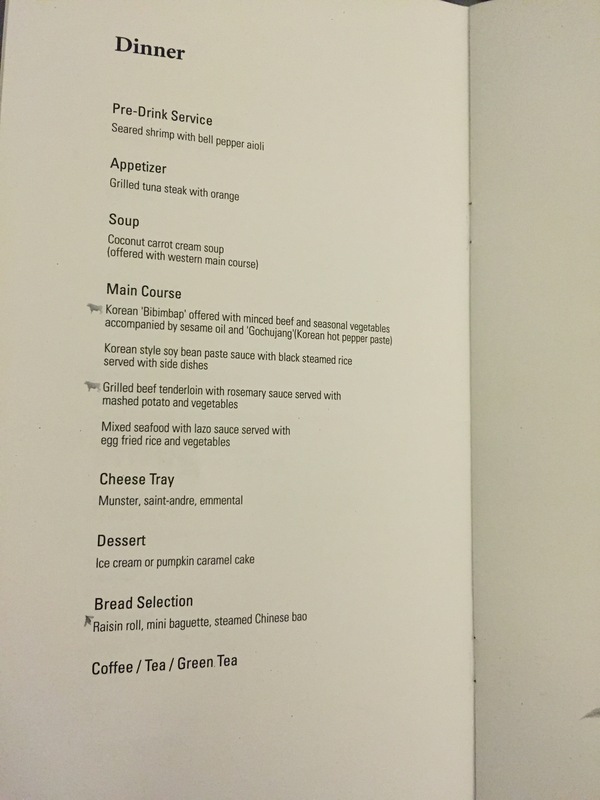 Menus were distributed, and I took a picture of both the offering for the dinner and breakfast menu. For dinner we both opted for more of the juice (which I found out secretly is Hawaiian Host Guava, and our local market sells it here in Seattle) and the seared shrimp which was delicious. Next was the started or grilled tuna steak with orange. 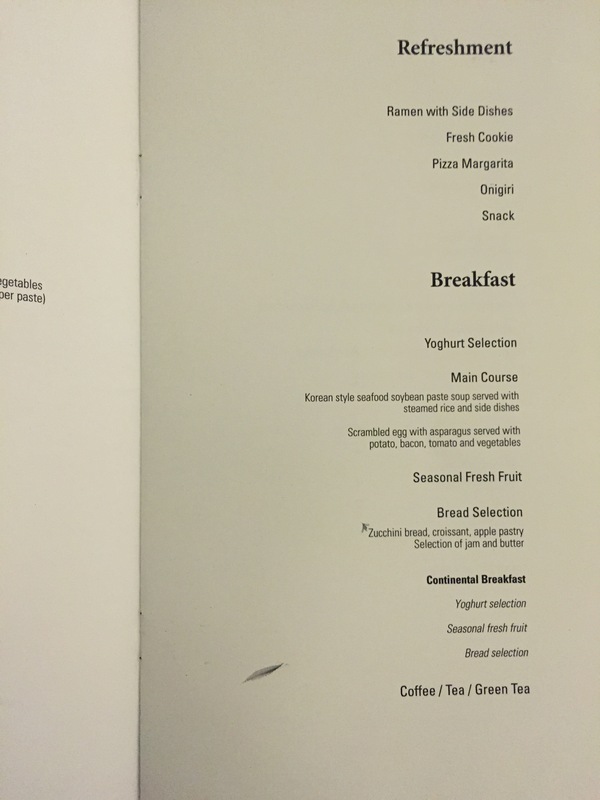 Notice also the tube of Korean Air hot sauce. Please note. Use sparingly!!! Also, check out the chopsticks that Korean Air gives. They are hevy and branded with Korean Air. I gotta say it was a nice touch and I liked the option to either eat with them or the fork. 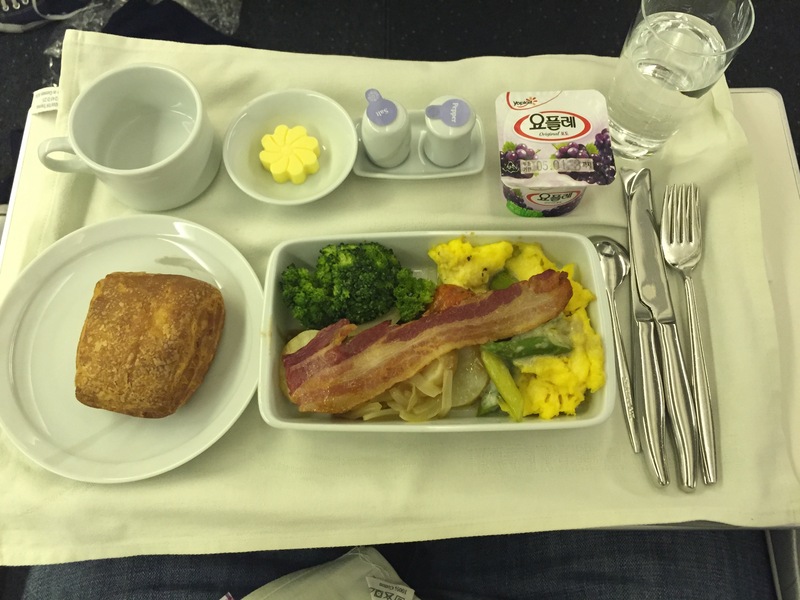 I’m a big believer of trying the “local” variety of foods offered on international carriers, as I feel they cater to westerners with options that aren’t the best, but they would do their own country’s dish very well. 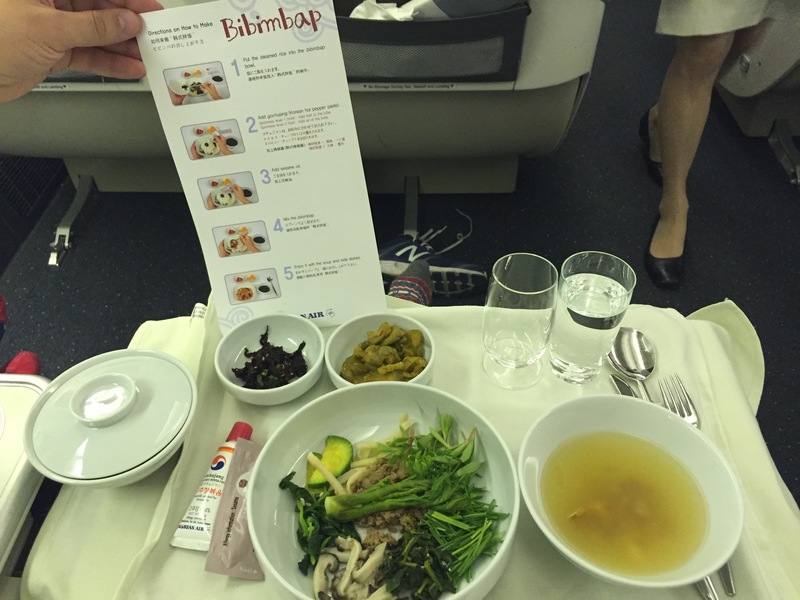 Since that option was the Bibimbap, the wonderful flight attendant asked me if I knew how to prepare it. I admitted that I didn’t and she gestrured for me to hold on for a moment. She came back with a printed instruction card in english for westerners who don’t know how to do it. I think step four is where you add the hot pepper paste, and the pictures show a LOT more than I think is needed. Did I mention that it will burn the hair off your chest? 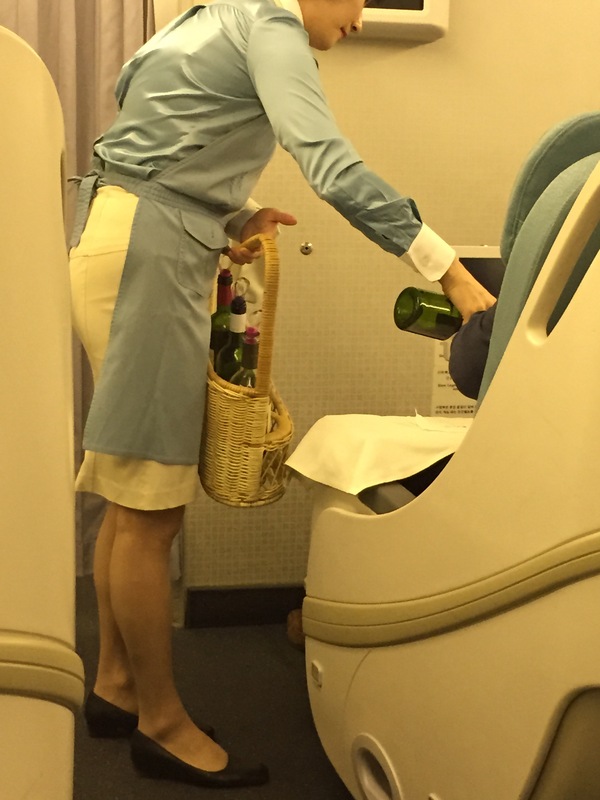 After dinner service the flight attendants came around with their picnic basket full of wine, which I liked. It seems very personal and casual, which I think is a nice touch. It compliments the service well and hits home the personalized and attentive service that Korean offers. There aren’t many things that are colder than a 15 year old, dirty, banged up aluminum cart rolling down the aisle to serve me my drinks. 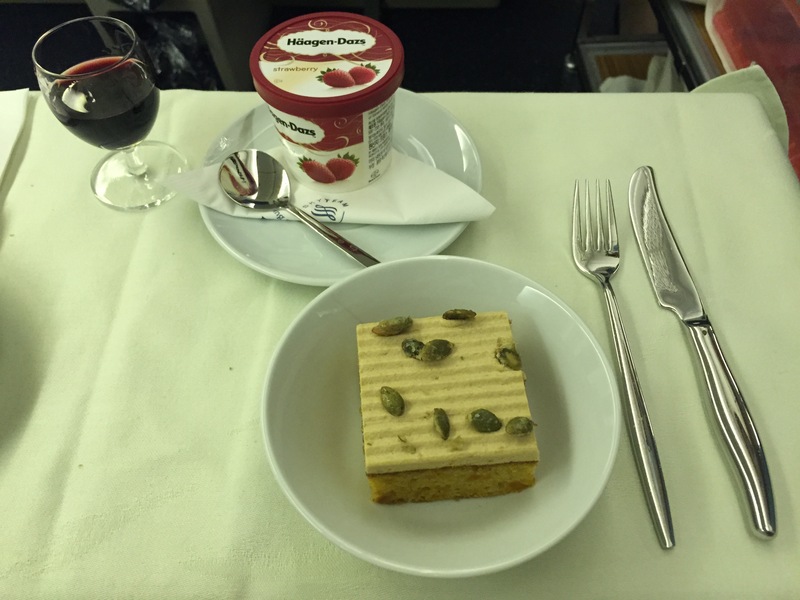 Since business class wasn’t full, I asked if I could try both desserts, and she happily obliged. Combine that with a glass of port and it makes it a fantastic pre sleepy time combination. It was just what I needed before a 4-5 hour nap. Now, I know that before I mentioned that I want to try local options, but I honestly could not bring myself to try the soybean paste soup, as incredibly appetizing as it sounds… so I went for the eggs and asparagus. After finishing breakfast, we began our descent into Seattle and were instructed how to navigate the US customer procedures. The service wasn’t excellent but it was average. 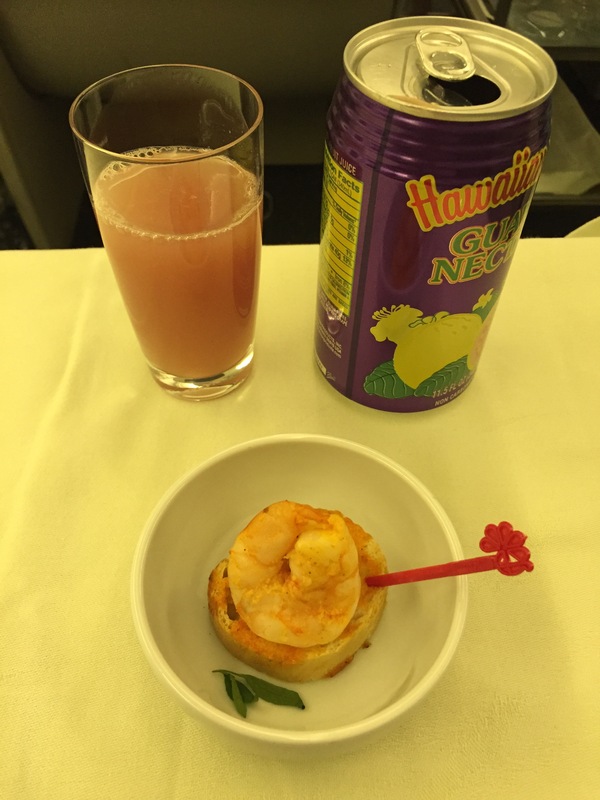 The food was nicely presented and the flight attendants were always available when you needed them, but there really wasn’t any connection made between the flight attendants and the employees. It was efficient and was a great option for returning from Korea. 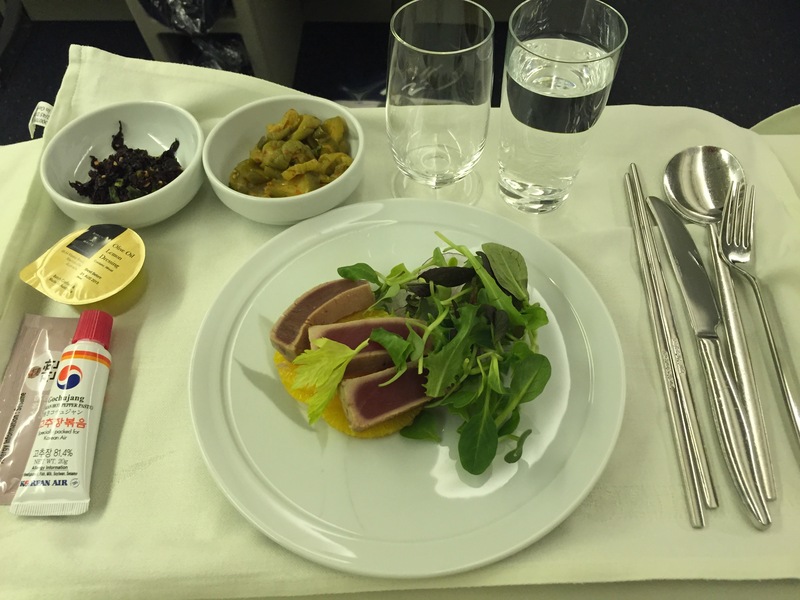 I will say that next time if I have the option I’ll try Asiana or Delta to compare the services to see what’s offered.